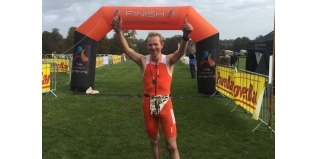 Multisport athletes, runners and Canicross athletes converged on Chilham Castle on Sunday, to take part in various events including the awarding-winning Chilham Castle Duathlon. The duathlon now in it’s sixth year was awarded Club Event of the Year 2016, by Triathlon England South East Region confirming Tri Spirit’s progress as a leading team when organising events. The day kicked off with the sprint duathlon with many racers returning from previous years. Rory Hopcraft, Medway Tri lead the men’s event home and smashed the course record in 1.18.03. Ian Reid followed in 1.22.01 and Joel Hodges finished shortly afterwards in 1.22.29. The record was also broken in the ladies event by local athlete Jenny Benson, of Canterbury Harriers, who was first across the line in 1.33.16. Becky Morrish finished second in 1.36.08 and Davina Greenwell of Hadleigh Hares crossed the finishline 1.38.38. The team winners were Team Buckley in 1.39.24. Tri Spirit team members also racing were George Whelan, 1.42.09 and Mike Blacker in 1.44.36, with Julie Bradford 1.52.15 and Steve Maxted 1.52.38 also racing in team colours. The standard duathlon is almost double the distance of the sprint, and this very challenging event consists of a 10K cross country run, followed by 40K bike section and a final 5K run to really sap the legs. Top age grouper and Kona-bound triathlete Claire Shea-Simonds travelled from Leciester to have a rare outing in a duathlon. This proved to be great choice as she won the event in 2.40.46. Tri Spirit’s Tara Symonds bagged second place in 3.05.04 and Karen Wale came in third in 3.14.52. In the men’s race Simon Shaw romped over the finish line in 2.17.07, followed by late entry Richard Arthur of Clapham Chasers in 2.22.14 and Steve Castle in 3rd in 2.27.29. In the team event Andrew and Richard Magro, with Rod Archibald won in style again smashing the previous record in 2.12.06. Also on offer for the day were 5K and 10K Challenge runs over part of the same course as the duathlon. Once again, the runners were in record-breaking form as Yiannis Christodoulou, smashed his previous course record with a fine finish in 20.48. Scott Lynch, Ashford & District RRC 21.26 and Simon Parrin was just 20 seconds behind in 21.46. The ladies saw Clare Berostad come home first in 30.50, Olivia Windle, 35.34 and Hannah Baker 36.12. The 10K Challenge run saw Vic Kenny, Tri Spirit Team again smashed the course record and winning the event outright in a time of 41.58. Second lady Helen Bellerby-Brown of Swale Tri Club finished in 50.38 and Melina Matzawrakos was third in 59.56. Jonny Wells, Ashford & District RRC, won the men’s event and was second overall, finishing in a fast time of 45.33. Greg Wood, Hythe Active, came second in 46.47 and Oliver Riches finished third in 46.47. New this year at Chilham Castle was a Cani-cross event which is proving more popular as the sport continues to grow in the South East. The 5K race was won by Hayley Empett, Dogfit Ashford in 22.46, with Sarah Lesting, of Aces Run in second in 24.28 and Nicky Parkington finishing third in 25.39. 10K Cani-cross was won by Natalie Songhurst of Kent Cani-cross in 1.10.32.